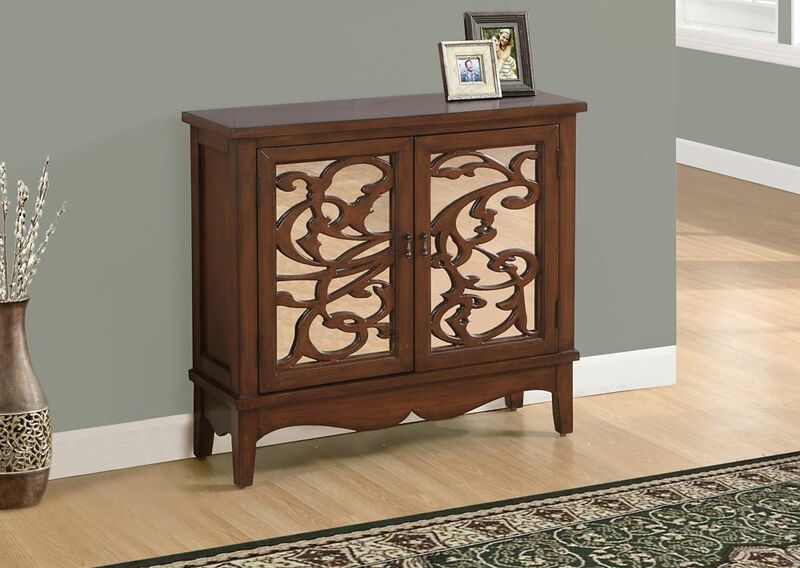 Add a touch of sophistication to your home with this traditional, dark walnut accent chest. Featuring a hidden storage shelf behind 2 cabinet doors that are adorned with a beautiful vine overlay and mirrored backing, and accented with brushed metal classic style pulls, this piece is the perfect combination of elegance and functionality. With ample surface area for you to display pictures and decorative items this chest will be the perfect addition to your entryway, hallway, bedroom, living or dining room. Embellish your space with this solid, beautifully crafted contemporary style side table finished in chic black. Featuring clean lines and 7 open concept display shelves, this practical accent table is perfect for showcasing your favorite decorative pieces, or a small plant, as well as a handy storage unit for your latest books. A versatile must-have accent piece for any space in your living room, family room, or office. What a convenient way to eat or drink on your couch! This beautiful dark taupe reclaimed wood-look finished hollow-core accent table has sufficient space for you to place your snacks, drinks and even meals. Its chromed metal base provides sturdy support With a fashionable flair that will suit any decor. Accent Chest - Dark Walnut / Mirror Traditional Style Add a touch of sophistication to your home with this traditional, dark walnut accent chest. Featuring a hidden storage shelf behind 2 cabinet doors that are adorned with a beautiful vine overlay and mirrored backing, and accented with brushed metal classic style pulls, this piece is the perfect combination of elegance and functionality. With ample surface area for you to display pictures and decorative items this chest will be the perfect addition to your entryway, hallway, bedroom, living or dining room.